Afternoon tea just wouldn't be complete without at least one great English tea sandwich. Among the favorites are delightful cucumber tea sandwiches. Not only are they incredibly easy to make, but these bites also have a cool and refreshing flavor that is perfect for summer when cucumbers are in season. Featuring fresh ingredients, these recipes are an absolute delight with your favorite tea. A favorite among tea sandwiches, fresh mint gives these easy cucumber tea sandwiches a summery flavor. They are seasoned with just a hint of lemon and salt and pepper to suit your taste. Try these with Moroccan mint ​green tea or with an iced spearmint or peppermint infusion. Salmon is an equally popular ingredient for finger sandwiches and it pairs nicely with cucumber. Although this recipe is for regular sandwiches, you can easily modify it to make finger sandwiches. Simply use white bread and less filling. Remove the crust, then cut each full-size sandwich into four small triangles. 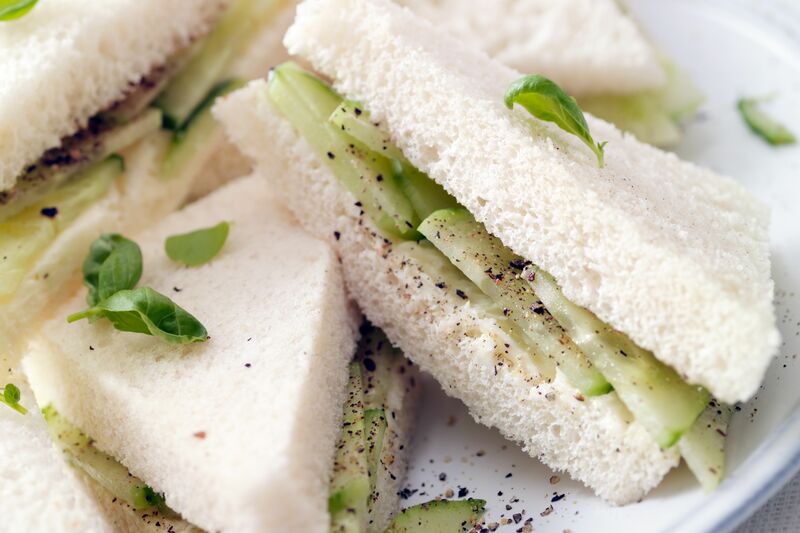 Kids adore this simple cucumber finger sandwich recipe, making it a great (and healthy) addition to a kids' party. The cream cheese adds a soft texture and you can add parsley or chives if you like. Best of all, these can be prepared in advance and chilled overnight. These delightful open-faced finger sandwiches are made with fresh dill, creme fraiche, white pepper, and garlic powder. They have a snappy-fresh taste and are sure to please your guests. As if any of these morsels can get any healthier! These cucumber dill tea sandwiches are filled with good-for-you ingredients. To complement the cucumbers, dill and soft cheese, organic cane sugar, cider vinegar, and dry mustard are added. It's all spread on rye or whole-wheat bread. Switch to wheat bread and slice up some radishes for this delightful finger sandwich. You can also choose your favorite herbs, such as parsley, basil, tarragon, and mint to complement the cream cheese. Keeping the ingredients as green as can be, it's hard not to fall in love with these cucumber-avocado tea sandwiches. Not only do they include the two signature ingredients, but you'll also find baby spinach, alfalfa sprouts, and cream cheese inside. Stuffed olives and Worcestershire sauce set this open-faced recipe apart from your more classic, English-style cucumber tea sandwiches. The flavor has a wonderful zing, which is helped along by paprika, garlic, onion, and a hint of vinegar. This versatile tea sandwich recipe can be prepared will all kinds of vegetables. It's immensely popular with kids, too. Choose any combination of bell peppers, onions, watercress, carrots, and spinach. Add more English cucumbers than the other vegetables to give the veggie cream cheese a lighter flavor. Tramezzini are Italian finger sandwiches and they're a fun, easy alternative to the British variety. The key to making this one fabulous is to use homemade mayonnaise. From there, you'll simply add cucumber, chives, dill, and a pinch of salt.